What a ridiculous spectacle that I witnessed as I walked home from Lunch. I have never understood the whole "star" fascination and this guy, I totally don't get. 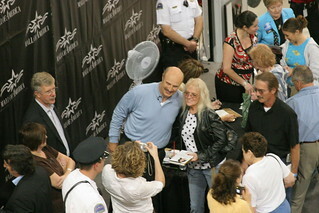 This was a book signing for his wife, but clearly the majority of the people there couldn't wait to get done having their book signed so they could have their picture taken with him.